Washoe County announces several ways it plans to conserve water. Reno, Nevada. May 12, 2015. The following report highlights several important agenda items from the Washoe County Board of Commissioners meeting Tuesday, May 12, 2015. Videos of County Commission meetings are replayed regularly on WCTV (Charter Ch. 193). You may also watch videos-on-demand online. 1. Presentation by Washoe County and Truckee Meadows Water Authority about drought and water conservation. John Erwin, the Truckee Meadows Water Authority's (TMWA) Director of Natural Resources Planning and Management gave the Board of County Commissioners a presentation about the drought and low water supply. He said since Lake Tahoe is below the rim, there is nearly no water coming out of Lake Tahoe which is resulting in very low river flows. He said within the next six weeks all of the ditches will be shut off, starting with the Steamboat Ditch. Erwin said TMWA will be relying more on pump wells this summer. "We haven't seen four consecutive dry years like this," said Erwin. "2015 is the lowest precipitation and lowest runoff we have seen. The good news is the probability of a wet year is increasing because of all the dry years we have had in a row. We plan for the worst but hope for the best." Washoe County has reduced water use by at least ten percent at County buildings and parks. Several parks and golf courses are irrigated with treated water or ditch water. County Park irrigation has been reduced by at least 10 percent. Washoe County has implemented the Truckee Meadows Water Authority’s suggestions in their Weather Wise Watering program. The County is watering in the early morning or evening, not watering on windy days or after rain and is watering on assigned watering days. Parks instituted a turf reduction program that eliminated nearly 119,000 square feet of turf at Lemmon Valley and Cold Springs Parks. The County implemented a phone number to call if you see broken irrigation lines in our parks: (775) 328-2311. "Washoe County is doing its part in conserving water," said Solaro. "We are working hard to be responsible and reduce the impact during this drought season." The availability of ditch water from the Truckee River is anticipated to be very minimal this year. With the 10 percent reduction and the lack of available ditch water, the public will likely see brown areas throughout Washoe County parks and golf courses. With the short ditch water season this summer, several of our park ponds may be lower than usual. In addition, the off-leash and multi-use pasture at Rancho San Rafael Regional Park will be closing due to a lack of irrigation water. The irrigation for the multi-use pasture comes from the Highland Ditch, which is fed from the Truckee River. However, the Federal Water Master has informed Washoe County the Highland Ditch will be shut off in the next couple of weeks because of low water flows in the Truckee River. Washoe County water play parks like those at Lazy 5 Regional Park and the North Valleys Regional Park plan to open and operate as normal. These parks recycle and recirculate water. The water is captured through a drain system and then filtered and treated much like a pool system. There is minimal water loss through evaporation. These water parks are great locations for families to use during the hot days of the summer, as a water-saving alternative to filling small pools or turning on sprinklers to run through. View a list of frequently asked questions about how Washoe County is conserving water. 2. Cooperative Fire Protection agreement allowing RAVEN to fight wild land fires. 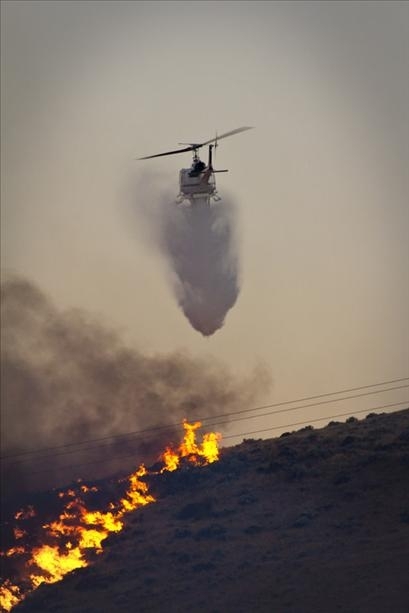 The Board of Washoe County Commissioners approved an agreement allowing the Washoe County Sheriff’s Office helicopter RAVEN to be used to fight wild land fires the next six months. The Annual Operating Plan for Cooperative Fire Protection Agreement allows shared use of RAVEN between the U.S. Forest Service, Humboldt-Toiyabe National Forest and the Truckee Meadows Fire Protection District (TMFPD). RAVEN can now be deployed to fight not only wild land fires but structural fires from May 16, 2015, to Oct. 14, 2015. 3. Greenhouse Project at Rancho San Rafael Regional Park. The Board awarded the bid to build the May Arboretum Project to ClearSpan Fabric Structures International Inc. The $126,422 project includes an engineered greenhouse with heating and ventilation, a control system and planting benches. The greenhouse will produce materials for community gardens throughout the County and provide a place for threatened and endangered plants to thrive. The Greenhouse Project at Rancho San Rafael Park involves multiple community partnerships and is one of Washoe County’s four Community Special Projects. Tahoe Prosperity Center’s vision is to keep Lake Tahoe clean, prosperous and sustainable. Tahoe Transportation District- Funds will go toward creating and implementing safe, environmentally positive transportation plans and projects for the Lake Tahoe Basin. Funds are for Crystal Bay, the Nevada portion of the Stateline-to-Stateline Bikeway Project that will go completely around Lake Tahoe. Renown Foundation-Funds will support the Truckee Meadows Healthy Communities Initiative, 89502 project. The 89502 project will create a community hub within neighborhoods in the 89502 zip code to address needs in that community regarding health care, social services, poverty or education, just to name a few. Friends of the Library- Funds will support print media, signage and children’s books for the bilingual population at libraries in District 3. Special Fund Grants for Districts 4 and 5 will go before the Board of County Commissioners June 9. On Feb. 10, 2015, Commission District Special Funds were created, providing $13,122 for each Commission District, for a total of $65,610. The money will support the needs of all County residents. 5. Code amendments regarding dangerous dogs. The Board heard the first reading of an ordinance amending Washoe County Code Chapter 55 regarding dangerous dogs. The existing ordinances were last updated in 2005. Changes to animal laws within the state have been made during the past two legislative sessions and the County is required to amend the code with those changes. The second reading will be held at the June 9 Board meeting.